I've been in my sewing corner all week finishing projects. 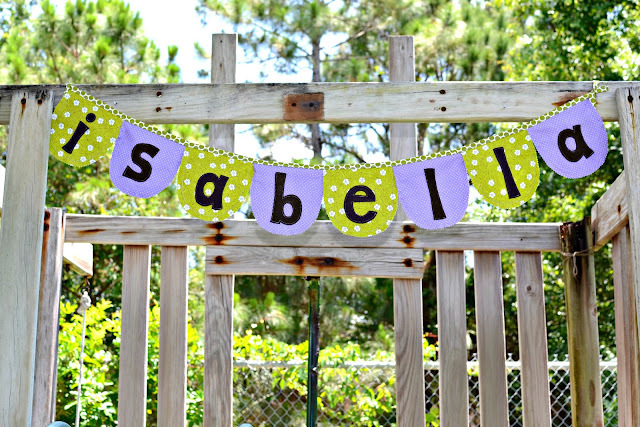 Here's another little name banner for my neighbor's new babe. Her nursery theme is Tinkerbell and I thought a name banner might be a nice addition. I hope they like it. All the fabrics are from JoAnn. I'm a lot happier with their selection of fabrics these days. For the binding at the top I bought myself a manual bias tape maker. I got tired of burning my fingers. It was a little tricky to feed the fabric through a first but so much easier to use than doing it by hand. It works great, though I might want to find one that is a little bit larger for making quilt binding. I felt like the 25mm was just a little too narrow.